Be able to display feeder callouts with spaces after commas, instead of having all the wire sizes right next to each other. It would be helpful when creating distribution equipment lists if there was an option for the manufacturer's name. Currently we have to use an unused Note key, rename the label for that key and then remember which Notes Setting corresponds to the list entry. In the diffuser definition dialog box, designate whether it is a 1W, 2W, 3W or 4W diffuser, then attach that number of arrows. When placing the diffuser, allow the user to rotate the diffuser to align the appropriate air flow direction. 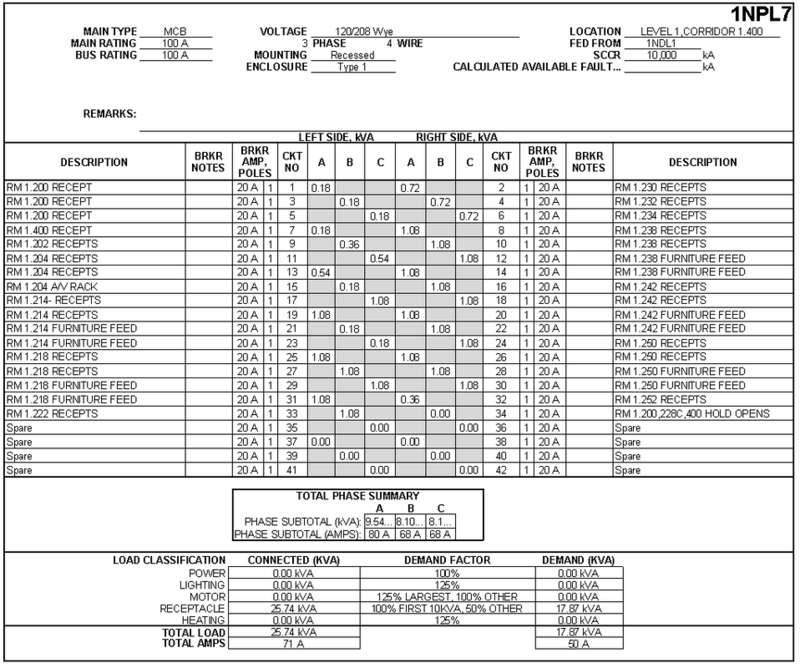 Having the ability to adjust the width of a schedule in the drawing model, instead of the schedule toolbox. When printing load calculations, have a Select All/Unselect All check box. It's a bit tedious to do manually. When defining rooms, it is often difficult to determine which rooms have been defined and which have not, if an area gets surrounded. Adding a hatch pattern on its own layer would make it much easier to determine if you've included all room definition areas. Separate column in the feeder schedule for the service grounding electrode conductor. The service ground does not get installed in the conduit with the service entrance conductors, so why is it shown just like all the other feeders where the equipment grounding conductor is installed with the feeder conductors. If you want the feature to show the GEC size, show it in a different column and show the feeder with no ground listed with the feeder conductors so its clear it is not in the conduit. Add an option to include a "1" in the wire callout before single ground and neutral wires. Currently the wire size is listed with no count before it. have the branch circuits upsize wire based on the voltage drop or have a setting similar to what we have in AutoCAD. Currently, the "Import Equipment from Another Project" command imports all the equipment. Update that function to allow you to choose specific pieces of equipment to import. In the Panel Description dropdown, add "Equipment Callout + Description" to the list, in addition to "Same as Equipment Callout" and "Custom". Assign a unique ID to each feeder in a project that can be scheduled in Revit and displayed in the AutoCAD one-line diagram. Have the ability to define a default device group name. In multi-phase projects it would be helpful to be able to set a group name as the default instead of having DM go to the "General" group. Be able to specify locations for labels in blocks. When the labels are added to the block, they will be placed in the desired locations, rather than in the somewhat random default location they are currently placed in. DM's default circuit layer system can be determined by three different options: (1) same as distribution equipment, (2) new, and (3) existing. We'd like a fourth option that makes the circuit layer system match the circuit layer system of the device that's being circuited. For example, we're currently designing a job where we are installing new receptacles that are being fed from an existing panel. Our receptacle circuit callouts are coming up under the existing layer system (based off of the panel) instead of the new layer system (based off of the new receptacles). To address this, we changed the default circuit layer system selection to "new", but then we realized that all of our feeders in our one-line diagram were now being displayed on the "new" layer system. Simply put, we want another option so the feeders match the layer system of the equipment that the feeder is going to, and the circuiting layer system to match the device that is being circuited.